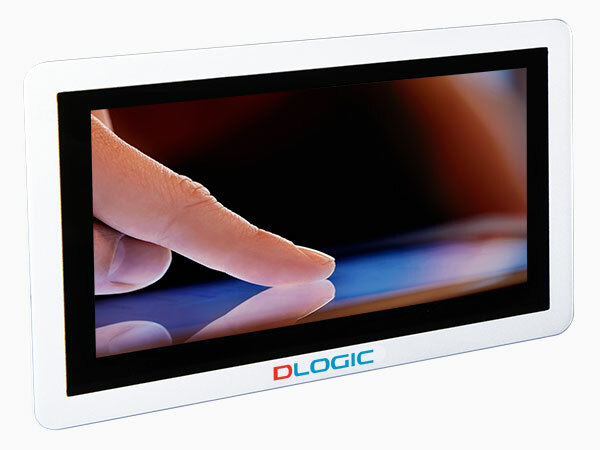 DLOGIC’s product series of versatile touch display computers, provides a state of the art device platform for the creation of modern responsive touch based user experiences. The DM product line is designed from the ground up by our highly skilled engineers and display touch technology experts for simple and quick integration into 3rd party equipment and professional solutions. The DM product family is flexible and feature rich and include models suitable for use in a wide range of applications and different environments including outdoor and harsh environments. Our DMs provide a cost effective fast track to equip your product with enhanced embedded computing power and state of the art modern touch based user interfaces. 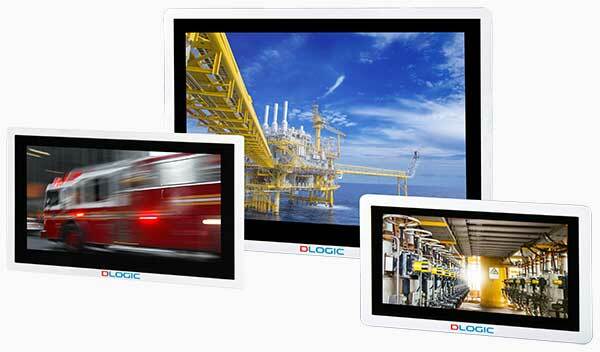 Our DMs consists of color display, touch sensor and an embedded computer mounted into an aluminum or stainless steel frame all wrapped in a robust stainless steel housing. A flexible set of interfaces are provided as standard and our standard Linux based software package is pre-installed with drivers enabling the available interfaces. DMs are fully functional and production ready and configured to run your application. Super-bright displays with ultra-wide viewing angles. Portrait and landscape mode support with the same device. 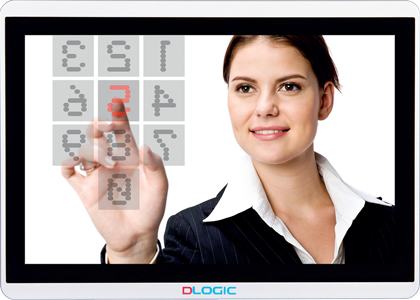 State of the art projected capacitive touch sensors for accurate and reliable touch detection. Diverse set of standard mechanical solutions available, including rear or front mount finished in different materials with many levels of ruggedizing options. Industrial electronics with differentiated processing options and flexible set of standard interfaces designed to industrial specifications. 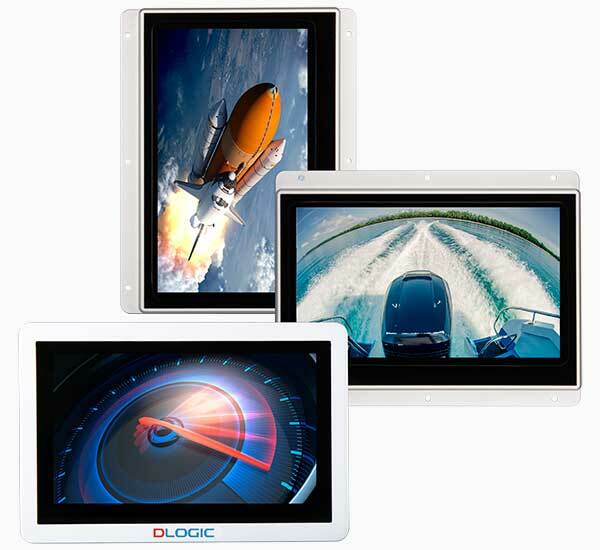 Models with optically bonded display and touch sensor available. All sizes can be provided with physically hardened optically bonded safety glass. Rock solid Linux distribution board support packages supporting CODESYS, HTML5 (Chromium), QT5 QML/C++, Java, Mono and VNC client application environments. Development kit with all necessary development tools provided. 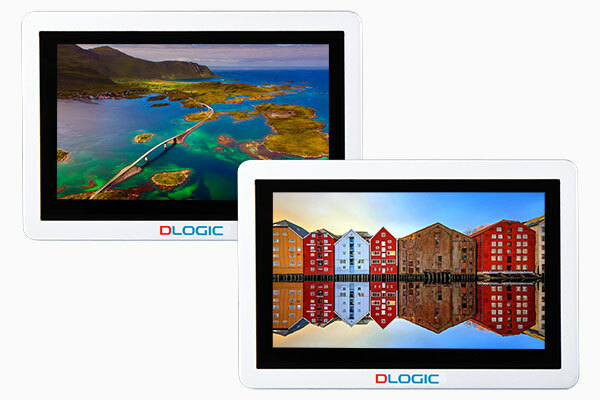 Employing specially designed high brightness backlights and technologies yielding wide viewing angles our DMs obtains a super-clear bright vibrant appearance providing the foundation for creation of state of the art user experiences for on par or surpassing high-end consumer grade and standard industrial solutions. 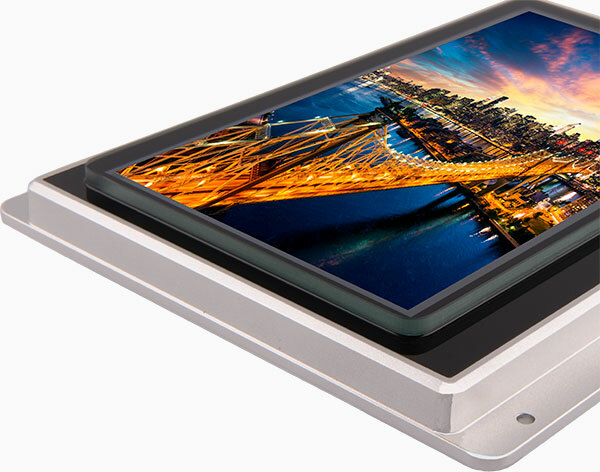 The wide viewing angles provides added flexibility enabling DMs to be used in both portrait and landscape mode. 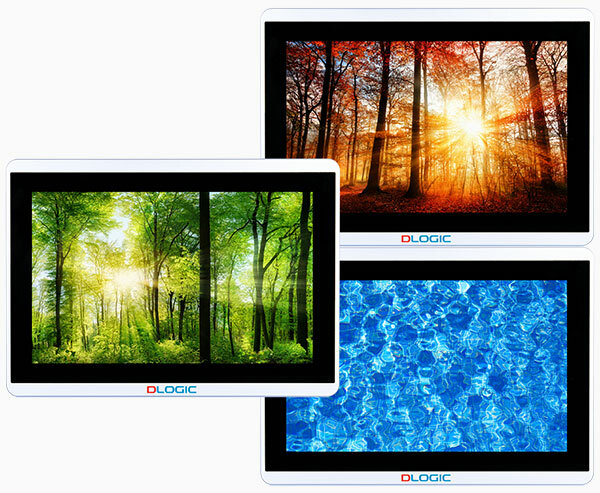 The combination of high brightness backlight and wide viewing angles also makes DMs suitable for both indoor and outdoor environments, and the light performance is further enhanced when optical bonding is employed for the touch sensor and safety glass. Our own engineers and production experts ensures that our displays are high grade made to the best quality standards always fulfilling the defined specifications. We accept no dead pixels or other typical display degradations. Employing high quality long life LEDs ensures that the vibrancy and brightness is sustained over the entire product lifetime even for long lifetime products. 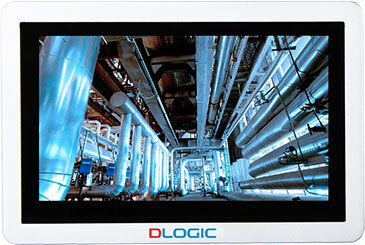 The DM product range include display options satisfying industrial temperature ranges and use in harsh environments. 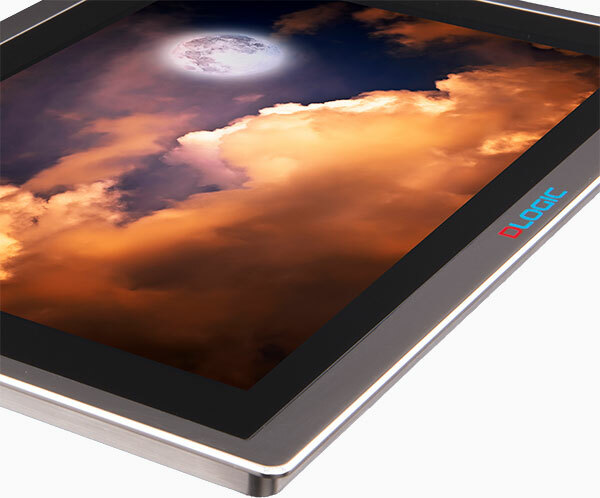 DMs are designed to suit the target environment of your application, and provides a choice of either projected capacitive or resistive touch technologies. Our touch sensors are custom designed for use in our DMs, and for integration into the complete module design to ensure robustness and long product life support. The capacitive touch sensors are based on world class touch controller technologies enabling accurate fine grained multi-touch control while also supporting gloves and water on the sensor. 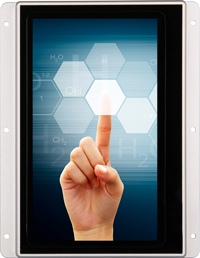 High transparency resistive touch sensors are available as a standard alternative to the capacitive touch based modules. Non-touch based solutions are also available and integration of alternative input methods such as push buttons and/or dials can be provided on request. 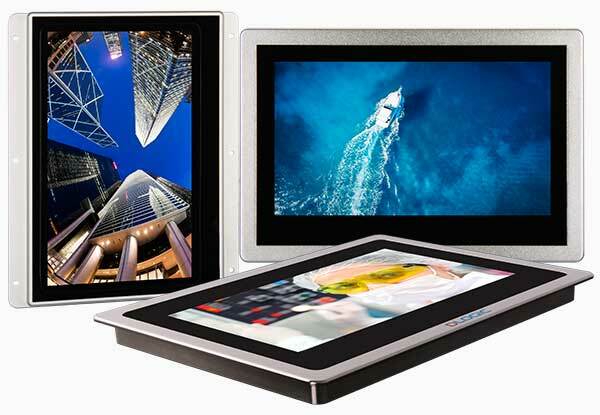 Many DM models are available with optical bonding of the display and touch sensor. The optical bonding process removes the air gap between the display and touch sensor by fixing the touch sensor directly to the display glass. This removes any unwanted reflection of light between the display and touch sensor. The result is a vibrant display of color and improved contrast yielding a pristine high quality look. Optical bonding is particularly important for equipment designed for outdoor use to avoid reflection from direct sunlight. 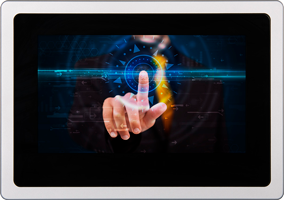 A major benefit of optical bonding is also that it ensures there is no possibility for dust and dirt to get in-between the display and touch sensor. Physically hardened safety glass are available in all DM sizes enhancing the robustness and impact resistance. The hardness of the safety glass is 8H or higher far exceeding the typically 6H hardness of industry standard touch panel glass and can pass various safety industry standards. The safety glass is optically bonded with the touch panel and can be seamlessly integrated into the DM providing a completely flat front surface. As an alternative, for internal rear mounting, a solution with the safety glass protruding out can be used enabling the DM to be installed into a front cosmetic pill providing a completely flat front surface. 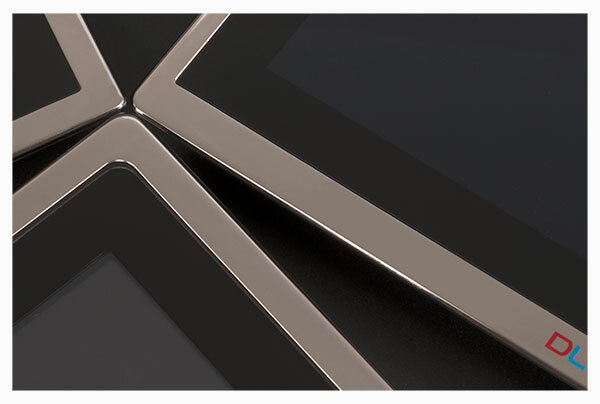 Our DM touch sensors are custom designed to support the safety glass solutions supporting reliable high performance touch detection and reporting. As an integral part of the standard DM product range a variety of different mechanical solutions are available tailoring the DM integration to your specific solution.Standard options for rear and back mounting are available with different frame material options including aluminum and stainless steel frames for corrosive environments.All DMs are enclosed in a stainless steel protective housing as standard. Special mounting solutions and materials can be made available on request. Different levels of ruggedizing are available as standard catering for different environments including water proofing, dust proofing, vibration tolerance etc. All DMs may be fitted with a protective safety glass covering the touch sensor lens. If the standard offerings are not sufficient or special requirements precludes using a standard model a customized version can be provided. In particular different housing / frame materials, mounting and sealing solutions can be provided. All DM electronics is designed to industrial specifications. All component selections are made to ensure wide temperature range and long product life support. Designs are made to ensure compliance and conformance to major standards such as CE and UL. As standard the DM supports a wide range of input power, and adaptations to specific requirements are available on request. All DMs has an integrated battery backed hardware real time clock and may be fitted with various audio options. All DM connectors are lockable and robust. When our standard connections are not suitable we provide enhanced solutions with the suitable connectors of choice. A core feature of the DM electronics design is industrial power solution with associated protection circuitry designs ensuring high efficiency and robust performance in a variety of environments. The standard DMs support a range of power input from 9Vdc ~ 38Vdc. The DM computer platform is based on the i.MX ARM based SoC family from NXP (previously Freescale). NXP provides long product life support for their i.MX industrial i.MX SoC product line. DMs comes in two performance options; with and without hardware accelerated graphics (GOU.VPU). 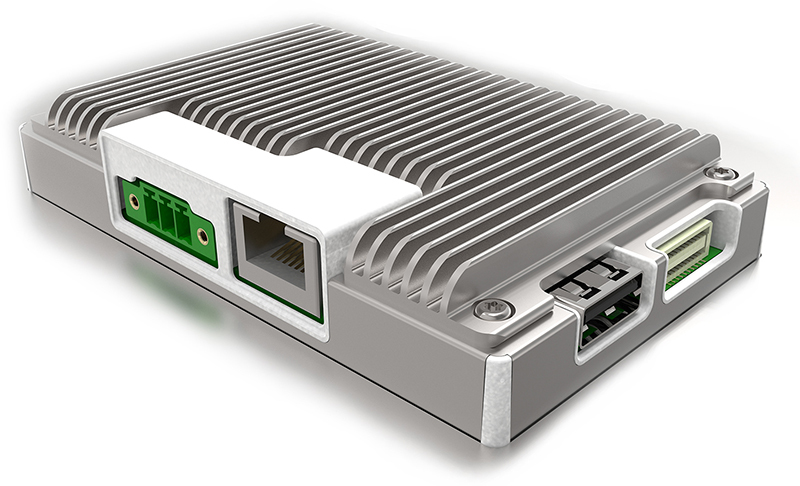 The i-series provide an efficient processing solution for graphical user applications not requiring a large amount of dynamic content, while the x-series with integrated GPU/VPU hardware support enables creation of highly dynamic user interfaces employing hardware accelerated OpenGL support and video encoding/decoding. The Debian Linux distribution in combination with the QT graphics environment provided with the DMs is an ideal software platform for reliable operations and efficient application development. The Debian Linux open source software solution is powering a vast number of server installation around the globe, and is famous for its stability and large number of thoroughly tested software packages available for systems designers to deploy in their solutions. DMs come with a fully functional operating system, with all drivers included, fully tested and used by many different customers. The provided QT library and development tools enables rapid development of state of the art graphical user interfaces required in the modern world of touch based computers. 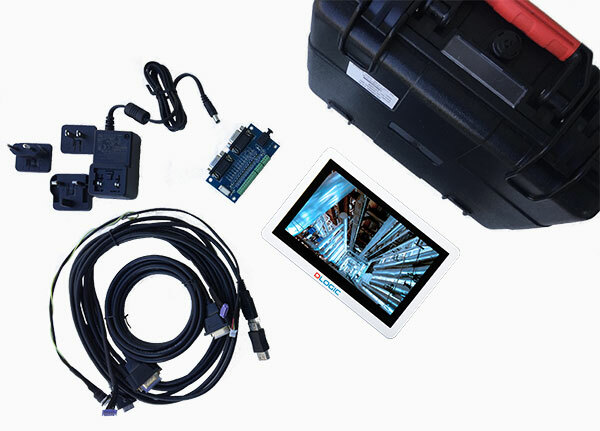 Developer kits with DM, connector board, necessary cables and software tools to quick-start development projects are available for all standard DM sizes. Our technical support service is available at no additional cost to all customers. Our DM development kits enables quick-start of application development on both host and target device. The target device is a production grade standard DM in the size of your choice. The host based environment is provided as a virtual machine running Debian Linux closely matching the target based DM environment. The VM includes pre-configured tool chains for cross compiling as well as an integrated development environment for graphical user application development with the QT5 libraries. 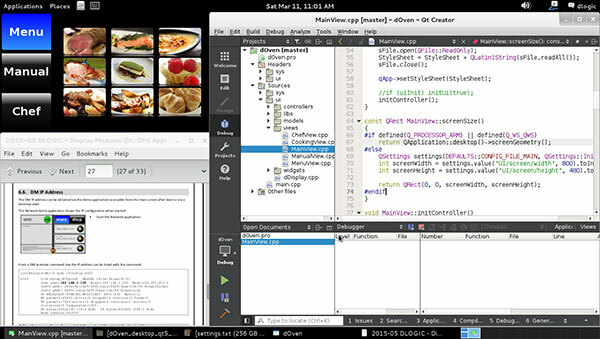 The development host is configured for QT application development and testing on the host and on deployment and testing on the target device. A number of example source code projects are provided to support quick start-up of your QT-based application development project. If you need additional library support in your BSP or QT is not your preferred development environment choice the Debian distribution repositories provides a wide range of alternatives that can be configured using the standard package management tools.